Here we are, April!! It actually felt like Spring when I left work yesterday! March is over and I am still without my computer... which is why I am posting late... Soon I will have it back (I hope =)!! This week Sweet Sketch Wednesday is Sponsored by one of our favorite faithful Sponsors... Bugaboo!! If you need a digi stamp for any occasion, you will be able to find it at Bugaboo... Something for every occasion. If you have never stopped by their site, or even if you stop by often, you really need to go check it out - there is something new to see each and every week!! This card is for a special someone... can any of you guess who?? 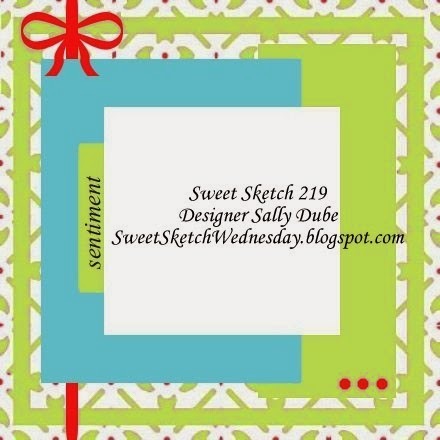 Thanks so much for stopping by, and I hope you will head on over to Sweet Sketch Wednesday 2 and check out the rest of the Design Team's creations - spectacular!! Love those muted papers. Very country looking. Awww, is this going to be William's mom first Mom card?!! I saved mine; what a landmark moment becoming a mom for the first time. I loved your card this week. So vintage looking. What a sweet Mother's Day card! I love Jodi's little Ewe's. The little hearts on this image are too sweet! Love your wood grain, petite flowers and dotted papers! And tied off with your jute and flower button...well, it couldn't be cuter! Have a great week and I hope your computer gets out the hospital soon! Well Sally I would have to guess it's for baby William Mum's 1st Mother's Day. I do love this sweet image it makes a perfect Mother's Day card. Mother's Day is celebrated on the 1st Sunday in May here in New Zealand and Australia I think. I do hope your getting your laptop back soon you feel so lost without it. I hope they quoted you for the job and not charging by the hour as it could have been cheaper to get a new one LOL Take care and wishing you a lovely week. These sheep are so stickin cute. Lovely card, Sally. How is the computer coming along? I couldn't do without one. What a gorgeous card Sally! Love those sheep! Your papers are wonderful too. This makes me smile! Such a cute card. I hope your laptop comes back soon. Sweet Sketch Wednesday with a Twist!! Fresh Brewed Designs - Choose your Challenge! !